The American Dental Association recommends every child and adult receive on the minimum twice yearly check-ups. However, certain individuals who have had a history of dental, gum, and bone disease may require more frequent visits as well as those who may have underlying medical issues. At Dentist Solana Beach, our dental team is dedicated to providing a strong foundation for oral health and dental wellness. Our Team is committed to ensuring all of our patients receive thorough individualized care during their visits. 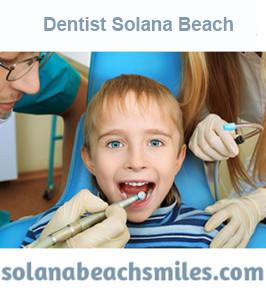 During your initial visit at Dentist Solana Beach, We will perform a comprehensive examination. This exam entails a thorough review of your medical and dental history and a discussion of your current state of oral health and what may be contributing to it. We will be assessing extra oral health of the head, neck, and temporal mandibular joint (TMJ) as well as intra oral health of the soft tissues, tongue, teeth, gums, and jaw bones. We pride ourselves on the fact that every individual is unique and has their own set of needs and therefore requires a personalized plan for treatment. Sometimes a simple discussion on the proper routine and frequency of oral home care and which products to use are all one needs. Other times a plan of action to attain dental wellness is determined after a more extensive review of your medical health, medications, diet and certain lifestyle habits which may be contributing to your dental, gum, and bone disease. Our exam starts with acquiring X-rays (radiographs). We recommend a full mouth series of digital X-rays and a digital panoramic radiograph every 5 years. Radiographs will not be required at every visit, the doctor will discuss whether new radiographs will be required periodically based upon your past medical and dental history . After we have our radiographic images, the doctor or hygienist will perform the extra oral exam and then move to the intra oral exam. We will perform an oral cancer screening and be using a video camera to view and chart detailed information of every tooth and surface. We then proceed to chart all of your gum pockets to determine what type of dental cleaning will be appropriate. After reviewing our findings with you we will determine the best course of action to bringing you to a state of dental wellness. After the examination and evaluation of your gum and bone health one of our professional and knowledgeable dental hygienists will perform the appropriate dental cleaning for you. Frequency of professional cleanings are determined by your current state of oral health and medical health. This allows all of us to be proactive in your dental and oral health care. A professional cleaning supplements the oral hygiene you maintain at home. We advocate adults brush three times a day and floss once a day while kids brush twice a day and floss once a day. We will discuss appropriate dental products for you to use such as toothbrushes, floss, toothpaste, and mouth rinses for your particular needs. We use digital imaging and software in our office to allow us to properly plan the particular treatment or cosmetic procedure that will improve the appearance and health of your teeth and smile. This software is highly beneficial for all of our patients who are considering cosmetic procedures to visualize how dramatic our San Diego cosmetic dentistry can improve their appearance before any treatment is completed. Digital imaging also allows us to document your dental case and procedures very well. We take digital images of your face, teeth and smile to provide us with a permanent dental record and to provide a visual documentation of treatment. In our office X-rays (radiographs) are digital. This is the modern alternative to the traditional X-rays taken by film and developed with chemicals in a dark room. Aside from utilizing far less radiation, this technology offers the convenience of having X-ray images available within seconds of exposure. These X-rays are then stored in the computer and can be viewed with enhanced features and improved diagnostic ability by our dental team. Digital X-rays may also be sent to insurance companies, patients, or other health care providers in electronic digital format. We use small intraoral cameras to help clearly see the condition of your teeth and gums. With this advanced technology our team can zoom in on diseased areas with extreme precision. The full-color images taken with the intraoral camera are sent to a computer screen so we can clearly see and diagnose dental problems much earlier than with traditional dental technology. Because images are displayed on our large screens, patients will also be able to see areas that may be problematic and gain a better understanding of dental procedures being recommended and performed. Problems in your temporal-mandibular joint (TMJ) can cause headaches, earaches, trouble closing your mouth, clicking or popping of the jaw, and pain or soreness in the jaw and muscles. Many people have TMJ problems because of the involuntary habits of clenching or grinding their teeth (bruxism). These problems may also be due to an improper bite, missing or rotated teeth, or trauma to the head and neck region. This could result in a change to the TMJ joint position, musculature of the head and neck, and biomechanics and forces in the mouth. Dental treatments to solve these problems are varied, but can include replacing missing teeth, moving teeth, adjusting your bite, filling gaps between the teeth or constructing a custom bite guard to relax muscles, relieve clenching or grinding, and correct a malaligned bite that may be contributing to the problem. Our team can help alleviate TMJ problems.